The answer: 1,648 horsepower. Or only around 800 HP if you just want to crack the double-ton. If you want to hit 190 MPH in a 1986 Mitsubishi Mirage you'd have to boost that little 1.6-liter to 410 HP. On the flip side, it only takes 21.5 HP to get a Vector M12 to hit 70 MPH. Here's how I know. Thanks to the magic of math, a compendium of car data, and one nerdy friend of mine, you can find out how much power any car needs to hit any speed with just a few figures. Here's how it works: Go here. Pick a make and a model, and the site spits out a couple graphs and some numbers based the coefficient of drag, frontal area, and weight. But that's just scratching the surface. You can get into the nitty gritty, adding temperature and elevation, the angle of incline (or decline), the atmospheric pressure, rolling resistance, and so on. 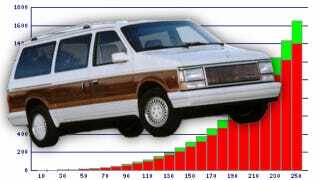 There's also a graph displaying the drag forces based on speed, which might be useful to calculate the never-ending runaway needed for Chrysler's flying brick to hit that top speed. If you're just looking for simple, quick numbers, there's a list of cars to choose from, but the database only runs up to the 2000 model year (the site's a bit… mature, but not in an NSFW way). But even with basic info you can find out that the Chevrolet Volt – with a Cd of .28, a weight of 3,786 pounds, and a front area of 23.7 feet-squared – would need 600 HP to get to 210 MPH. Or that an Aptera 2e (with a super low Cd of .15) could hit 170 HP with just 230 HP. Granted, these are rough estimates, but I could do this for hours, or until Max's server bursts into flames.